Caitlin has enjoyed working with clients across all age groups and has experience treating a wide variety of musculoskeletal impairments . 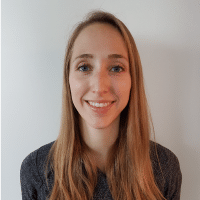 She graduated from the University of Waterloo with a Bachelor of Science in Kinesiology with a minor in Human Nutrition and from McMaster University with a Masters of Science in Physiotherapy. She believes in utilising a client-centred approach to help you effectively and efficiently reach your rehabilitation goals through a combination of manual therapy, soft tissue release, dry needling, education and individualised exercise prescription. She is passionate about educating clients on how to achieve and maintain a healthy lifestyle to promote prevention of future injury or illness. Caitlin has completed training in dry needling, soft tissue release, concussion management and is BoneFit certified. She is committed to continued learning and is working towards completing the manual therapy levels. To learn more or to book with Caitlin please get in touch.